With half-term over and the darker nights setting in, we are today unveiling a five-month campaign to promote the county as an all-year-round visitor destination. Our programme of seasonal marketing activity reached a combined audience of more than 32 million last winter, including the full spectrum of social media, travel features in national newspapers and 1.9million eNewsletters to targeted customer databases. With huge potential to grow the seasonal visitor economy when Cumbria has the capacity to accommodate additional visitors, the latest phase of #theplacetobe campaign again aims to drive much-needed trade during the winter months and encourage longer stays across the county. It will run alongside the newly redeveloped ‘GoLakes card’, which is a visitor rewards card offering special deals over a two week stay between now and the end of March. 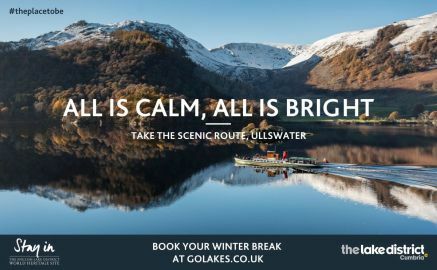 The card will be available to purchase on GoLakes with complimentary cards being given to visitors that book through the site during the winter period. An important part of the #theplacetobe message will focus on older couples who are less constrained by family routines and are more likely to visit midweek, as well as the younger ‘buzz seekers’ who enjoy outdoor challenges and outdoor experiences during the winter.